Dr.Malpani's Blog: Why are we seeing an epidemic of new IVF clinics in India? There seems to be a new IVF clinic starting in practically every nook and corner in every town in India. Why this sudden spurt of IVF clinics coming up all over the place? Is it that the number of infertile couples has increased so dramatically that the requirement for IVF has gone up so sharply? The reason is actually far more crass and commercial. Senior obstetricians and gynecologists who are tired of delivering babies and hysterectomies want to do something new and different and cutting-edge. Many think IVF is a very lucrative field, and rather than referring their patients to an IVF specialist and losing all that potential income, they feel, "Why don't I just start an IVF clinic myself? After all, how difficult could it be? I've been a gynecologist for so many years, and with my expertise and experience, I am sure I could IVF equally well ! " Because so many gynecologists want to get on the IVF band wagon, lots of companies have sprung up which are happy to help gynecologists to set up their own IVF clinics. They do this on a turn-key basis, and their charges vary from Rs 10 lakhs to Rs 1 crores, depending on the pay capacity of the gynecologist. This means that you make your payment, and you have an IVF laboratory set-up for you in a few weeks ! You then just have to attend a workshop, or two, get trained in doing IVF in a few days, and you can call yourself a gynecologist and IVF specialist ! No one can stop you from doing this in this great country of ours, because no one really checks to see whether you have the adequate training ; skills ; experience ; expertise; manpower; or equipment to actually do the IVF for your patients. 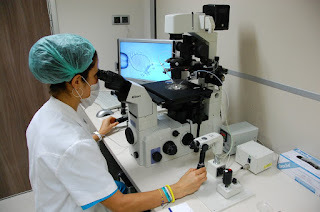 Once you are ready to go, since you are a practising gynecologist, you already have a captive patient population, and can start doing IVF on them . In India, it's perfectly acceptable to use your patients as guinea pigs - they are trusting and naive, and don't know any better. And if you want, you can always hire a traveling embryologist and a visiting IVF specialist to come and do the IVF procedures for you, if you don't want to do them yourself ! As long as you're making money, everything's hunky dory , because no one really cares about your success rates - and no one is going to check them ! The tragedy is that this has been going on now for many years now, and the pace has been accelerating over the last four or five years. Sadly, medical colleges don't provide IVF treatment to their patients, which means most MD gynecologists don't have any practical exposure to doing IVF, or even seeing IVF patients. Finally, it's the poor patients who end up being been taken for a ride . They don't understand any better, and they assume that any doctor who calls himself an IVF specialist must be a good doctor, especially when they're so senior and have been practising a gynecologists for so many years. Sadly, the government of India has turned a blind eye to this exploitation of infertile couples, so that even though the Indian Council of Medical Research is supposed to regulate IVF clinics and make sure that they have the equipment and expertise which is required, they do this purely on paper only. Most IVF clinics in India do not have the infrastructure or manpower needed to do IVF, and the majority have not even bothered to register with the ICMR, and yet they continue functioning merrily. The Law which was supposed to regulate IVF in this country in order to protect infertile patients is still on the back-burner, and no one knows when it's ever going to be passed. As a result of this, infertile patients continue being taken for a ride, and this is tragic , because doctors who should be speaking up are all keeping quiet, because we don't want to speak any ill of our colleagues. Indian patients cannot rely on either the government to protect them; or on doctors to regulate themselves. They need to learn to ask their doctors pointed questions about the IVF treatment they offer , otherwise they will continue being exploited. The good news is that you need to ask only one question to find out if your IVF doctor is any good. The simple question you need to ask is - Do you give photos of embryos before transferring them ? If the doctor says no, this is a red flag , and means this particular laboratory is not well equipped. If you don't want to get cheated, you need to find someone else ! The futile quest for certainty in IVF treatment.